Happy Miniature Monday! So much has happened since last Thursday. Wednesday night I became ill and suffered chills, body aches, exhaustion, etc. I felt like I got hit by a truck and had to take the next two days off from work. On Thursday afternoon, I was lying on the couch miserable, when the Dark Sword Masterworks DVD set featuring Jessica Rich arrived in the mail. Perfect! Watched Discs 1-3 while I was stuck in bed sick. More thoughts about what I learned as soon as I finish the set of 6 DVDs (approx. 20 hours). She's one of my favorite miniature painters and I've been blazing through it so far! I also backed the Dark Sword Kickstarter featuring the artwork of Stephanie Pui-Mun Law, an accomplished fantasy artist. Check out her prolific body of work here. I think her whimsical illustrations really tell a story within the world she creates; one can really get lost in those beautiful, painterly images. As of today, there are 5 days left in the project. The Dark Sword interpretations are absolutely stunning. I can't wait to own this new line of Dark Sword miniatures-- Patrick Keith did an excellent job with the sculpts! As far as actual painting goes, once I was feeling better, I did some work on Tish & Drak, both from the Reaper Bonesylvanians line. Both are coming along and I hope to have Work In Progress pictures of them soon! I also finally, finally finished Lord Ironraven. 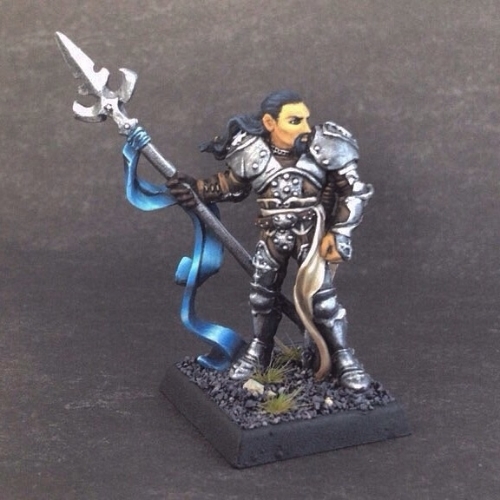 This poor Reaper mini sat on my Shelf of Shame for years before I mustered the courage to paint the swath of silky cloth & large amount of metal armor. I practiced my TMM (True Metallic Metal) techniques on him and even attempted to paint some scratches on parts of his armor. I'm happy to report that he's finally based and no longer a member of the Shelf of Shame, where unpainted or partially painted miniatures await completion. I also find that metallic paint is especially hard to photograph. I tried two different backgrounds to try and photograph the miniature without washing out his face while trying to capture the metal highlights. It's not perfect, but I'll figure it out eventually! Lastly, I was able to take somewhat decent (but not great) pictures of my vampire miniature. I'd like to make a few changes & touch ups to this miniature, but he too can join the ranks of finished miniatures. Huzzah! ...which reminds me: Only one more week to finish Jen from Hasslefree miniatures for the next #speedpaintchallenge! Better get to work on her tomorrow-- even if it's just cleaning and priming. I better have something to show on Thursday or else I'll be rushing at the very end. While it's four-hours-or-less speed paint, it's never a good idea to paint when rushed. I'll have to make some time for her this week. Hopefully I'll have a WIP photo or two to show in my blog Thursday post. Until then!